JUKI, pick and place for lead-free circuit boardassemblies to your design. Wave solder services also available. Founded in 1963, Vista Manufacturing Company has 54 years experience with precision sheet metal fabrication, machining, and electro-mechanical assemblies. Conveniently located off I-70 in Kansas City, Kansas. From prototype to production run quantities, your order is manufactured with pride in our ability to provide the quality that you require and expect. 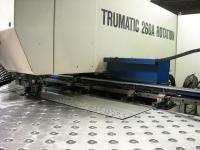 Email or call us for your sheet metal, machining, and electro-mechanical designs. We can help you transform your ideas into production! Please call Andy Gredell at 913.342.4939 for further information.